On December 14, 2012, gun violence erupted in Newton, Connecticut. A lone gunman entered a school and killed 20 children and 6 teachers and administrators. The topic of gun control, both pro- and anti-, had already been a fairly hot one; now, it was the leading conversation topic on everyone's minds. Folks lined up predictably: conservatives generally tended to be against it, citing quotes like "guns don't kill people, people kill people," and the 4th Amendment; liberals were equally vocal from the other perspective, quoting statistics from countries with strong gun control legislation, as well as making emotional appeals. Stocks of gun makers slid, as the market anticipated changes that would be negative for their bottom lines. One such gun maker was Smith & Wesson, perhaps the best-known American gun maker of all time. Smith & Wesson can be traded via its holding company, Smith & Wesson Holding Corp (SWHC). Just a week or so before, SWHC reported earnings higher than analysts had estimated, and raised guidance for 2013. Regardless, SWHC stock dropped from its high of $11.25 to $9.40 in two of the days leading up to the Dec 14 violence. Afterward, SWHC slid even further, closing at $7.79 three days later. On December 19, 2012, President Obama gave a press conference discussing various topics, including the Dec 14 tragedy and the possibility of gun control in the future. The full transcript of that speech can be found on the Washington Post website. The chatter on facebook, where I do most of my crowd-watching because of its raw knee-jerk flavor, universally agreed that massive gun control measures were coming; some people opined with satisfaction, others with chagrin. I watched this flood of prognosticating carefully for the next two days. The daily traded volume of SWHC eclipsed any other volume spike that year by about 60%, including the massive two-day 37% rally it enjoyed in September, 2012, following a truly magnificent earnings report. On December 21, 2012, I bought SWHC at $8. My reasoning was that the entire nation was overreacting in its prediction of the policy outcome. Call me cynical, call me contrarian, call me cold and heartless, I don't care. But I saw a stock that had no business being nearly 30% lower with rising profits. I also saw that many conservatives were taking the President's comments as a call to buy guns before it became too difficult to do so. SWHC continued to bounce around on Dec 21, closing just 10c above my purchase price. I said at the time that I would hold it as long as necessary to get a good return out of it. I had a soft mental stop price of about $7 to start worrying, and a pie-in-the-sky profit exit of about $16: double my money. I didn't expect $16, of course, but if it got there, I would take the money and run. In the second week of January, I traveled to Salt Lake City, UT, for my annual ski trip. One evening after skiing, I proposed that we go to a local gun range and store for some target shooting. John and I did so, and the place was so packed that we gave up and tried the next night. We arrived a little earlier and found the store a little less crazy but still very, very busy. And folks weren't just looking, they were buying. I asked the store owner why he thought it was so busy, and he looked at me and chuckled, saying, "why do you think?" We had fun shooting, and I went home feeling very optimistic about my investment. 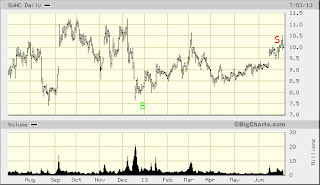 January 16, 2013, was a big day for SWHC: it opened at $8.40 and closed at $8.91, seeing a high for the day of $9.25. During the ensuing price action, I placed an order to sell covered calls against it: targeting a strike price of $10 with a March expiry. I wasn't filled that day, but early the next my calls sold for 55c/share. When I do covered-call trades, I like to discount the purchase price by the amount of the premium; thus my effective buying price for SWHC was now $7.45, 22c/share lower than the low on Dec 18 at the height of the gun control sell-off. 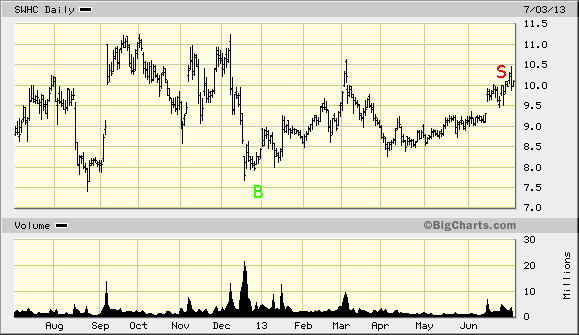 On March 5, 2013, SWHC hit its high since the December sell-off, peaking at $10.63 and eventually closing at $10.22. That evening it missed estimated earnings, and subsequently sold off into the options expiry weekend, closing at $9.21 on March 15. My covered calls expired worthless that weekend, and I started working a new covered call order the next week. In retrospect, I could have maximized my profits by selling $9 strikes in January instead of $10 strikes. But of course that would have required me to see the future, which I cannot do. I sort of lost track of my SWHC position for almost a month, refreshing my covered call order in mid-April, and finally getting filled on April 25, selling June expiry calls with a strike price of $9 at 45c/share. This brought my effective purchase price down to a nice round $7/share. I hoped for similar price action to the previous quarter, since that would allow me to sell even more calls at strike prices above my purchase price, but alas the next earnings report was much more positive, and I was assigned my calls over the June 21, 2013, expiry weekend. I was out of SWHC at $9/share, with an effective purchase price of $7/share. That's about 28% in 6 months. Maybe I could have squeezed a little more money out of this trade, but considering I would forget about it for months at a time, I'm pretty happy with it. Contrarian investing is not for the faint of heart. I have doubled down on GLD calls three times now during the 9-month bear market we've been experiencing, and it seems that Bernanke has a personal vendetta against my position. But sometimes, when the world is screaming "Sell" at the top of its lungs, it is very profitable to accommodate them. This was one of those times.